Yes, Adam Pacitti(pictured) is looking for a job. As you can see, he had purchased the media placement on a billboard. But the story is not that simple. As mobile trends is emerging, it has become one of the dominant sources of usage for online surfing. Now, this would be how Adam’s ad would work really well when he integrates with social platforms like Twitter. You will now witness the power of how Twitter would work as a power duo together with Outdoor advertising medias like the billboard in this instance. Adam’s efforts took off pretty well I must say. Now in just two days, he had gotten himself on the global scale. 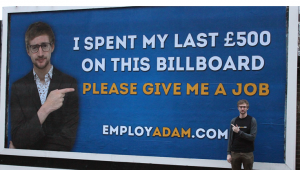 With close to 30,000 views on his CV on YouTube, he amassed close to 10,000 followers on Twitter and 13,500 retweets for just this one single image of his 500pounds billboard ad. Personally, I think this is really a very bold effort that is commendable. The success of his efforts would pretty much be attributed to the social integration leading after the ad placement. For Adam, he merely bought the poster as it was in his opinion the most visible form of communication. The trick was how he actually leverage on this ad and develop an integrated viral social media campaign. If you are one of those marketers who have been diligently placing ads on billboards with futile results, then it is high time you check this out and understand that success is no magic, luck or determination. It is purely understanding marketing trends and strategy. You got to tie in the right channel for the right message for the right people at the right time. Adam has successfully proved to many that he has done it right. From this we can undoubtedly conclude that Outdoor and mobile search complement each other very well. When you see something really fascinating, you would automatically take out your smartphone and start searching for it. I guess a lot of outdoor posters these days typically has a picture of the product and probably the company’s telephone number slapped across. By doing so, brands cannot expect the same amount of success as compared to a more interesting poster with a unique call to action. The catalyst to fuel that constant challenge in driving engagement and action after seeing the poster naturally falls back to your idea. Is your idea creative? Can you do something that would evoke an action or curiosity? Have your poster distracted their attention? Never hope to do minimal work, because the lesser amount of effort you place into developing your materials, the lesser amount of returns you would get. Basing your judgement of success purely on past statistical reports of that particular ad placement is important but not necessary a winning formula. Instead, think of how you would want people to start talking about your ad online and create hype amongst them through provocative messages and visuals. You would want people to start talking about it on Facebook or Twitter eventually. I believe outdoor advertising is extremely crucial and should always be packed as one of the considerations when starting a marketing campaign. It should always serve as a communication touchpoint to boost a brand’s activity and presence to the large groups of people. Try to capture people’s attention, get them to do something after seeing your ad. Make them want to tell their peers about you. Give them the topic to talk about that would boost their credentials, capabilities or display their eagerness to share. At the end, Adam did a wonderful job of enhancing his life by giving people something to talk about. Let people feel curious about his message, about the outcome of his job search and what they could possibly do to help him land a job. There is so much more to be done. Hence, never underestimate the power of both outdoor and social.